Quintavius Oliver’s “Ride to School” is part of “Zindagi: A Celebration of Daily Life in India” at Griffin Museum. WINCHESTER — There are several English translations for the Urdu word “zindagi.” They include “life” and “that I am alive.” Both suit “Zindagi: A Celebration of Daily Life in India,” the vibrant and colorful show that runs through Nov. 27 at the Griffin Museum of Photography. It consists of work from five photographers. Their focus on the subcontinent ranges from the mythological to transportational. 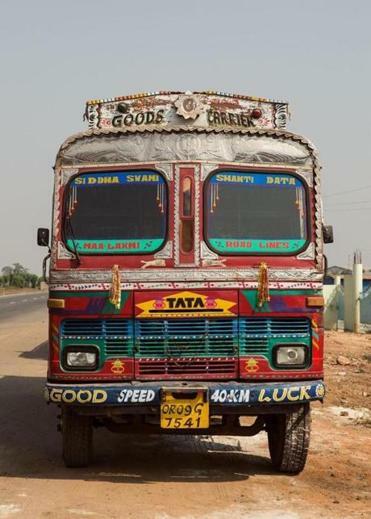 Transportational is too general — but truck doesn’t have its own category (or does it?). The 14 photographs from Dan Eckstein’s “Horn Please” series pay tribute to Indian trucking, truckers, and their fondness for decorating their vehicles. Further, the Merry Pranksters’s psychedelic school bus, had nothing on these guys. In some photos, Eckstein shows drivers sitting behind the wheel, looking like any group of tired workingmen. In others, he shows the trucks. Tired is the last word to describe the pure visual fun of their decorativeness. Quintavius Oliver’s 18 photographs are either street scenes or close-ups of ordinary people’s extraordinary faces. At least one is both. 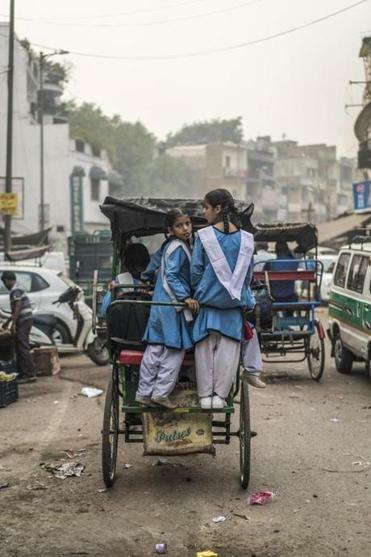 “Ride to School,” which shows two girls on the back of a rickshaw as it heads down a street, is no one’s idea of a portrait. But the girls’ faces are so indelible, and they so completely anchor the image — they’re dead center within the frame — Oliver could be pursuing portraiture by other means. Where Eckstein and Oliver show the external, Priya Kambli’s “Color Falls Down” limns memory and emotion. Born in India, Kambli moved to the United States at 18. Her diptychs and triptychs collapse time and distance. They combine everyday items of personal significance — jewelry, handwritten pages, fabrics — with portraits of Kambli, ranging from childhood snapshots to photographs she has taken of herself. The effect is of privacy shared, identity assayed, emotion expressed if never articulated. The subdued elegance of Kambli’s work is far removed from the wild assertiveness of Manjari Sharma’s nine photographic portraits evoking Hindu gods and goddesses. The pictures are borderline enormous: 5 feet by 6 feet. The colors are garish. The frames, which are very much part of the package, are as elaborate as Eckstein’s trucks. Raj Mayukh Dam has three videos in “Zindagi.” Their contents consist of both still photography and moving images. The weakest of the three shows the Holi festival, in Nepal. There’s a lot of face painting, mugging for the camera, and most of the participants look like applicants for a ride on Further. “People of Sundarban” documents rural life in the mangrove forests of western Bengal and southern Bangladesh. The best of the videos in “Antyesti,” chronicling Hindu funeral rituals. The images are both informative and beautiful. It does seem a bit odd for Steve Jobs to be quoted on an intertitle, as are the Bhagavad Gita and Rabindranath Tagore . Well, the monitor the video plays on is an Apple. Drawn from Tamil soap operas, the 10 images in “The Third Eye” can be as wild as Sharma’s deities. “The Bindi Collection” also consists of 10 photographs. A bindi is the red dot worn by Hindi and Jain women on their forehead. When not wearing them, women will often just stick them on a wall. Williams-Krishnan would take pictures of her mother-in-law’s set-aside bindis, a braiding together of the decorative and quotidian. “Morning Poetry” comprises 20 photographs Williams-Krishnan took early one day at her in-laws’. The images are casual, like snapshots, yet also unforced and lyrical. Calling them poetry is justified. ZINDAGI: A Celebration of Daily Life in India. Manjari Sharma, Priya Kambli, Dan Eckstein, Quintavius Oliver, and Raj Mayukh Dam. KALACHARAM: Photographs by Julie Williams-Krishnan. At Griffin Museum of Photography.